This is SCIENCE FRIDAY. I'm John Dankosky. Ira Flatow is out this week. Last December, Steven Coughlin, an epidemiologist at the Veterans Affairs Office of Public Health, resigned his position. And last week he told a congressional subcommittee why. He had serious ethical concerns about the research being done on Gulf War Illness at the VA. He accused the VA of manipulating data, of deliberately concealing data on the possible causes of Gulf War Illness and of failing to follow up with veterans who reported having serious mental health concerns. Dr. Coughlin also told the subcommittee anything that supports the position that Gulf War Illness is a neurological condition is unlikely to ever be published. That testimony was something of a bombshell for those studying Gulf War Illness and left us with the question: What do we know about Gulf War Illness? It's been more than 20 years since the first Gulf War, and according to an estimate from the Institute of Medicine, as many as 250,000 veterans, more than a third of those who served, are still suffering from this mysterious array of medical ailments. How close are we to finding a cause? What about treatments? That's what we'll be talking about this hour. Let me introduce our guests. Lea Steele is a research professor of biomedical studies and director of Baylor Veterans Health Research Program at Baylor University. She's also a member of the congressionally-mandated Federal Research Advisory Committee on Gulf War Veterans' Illnesses. She served as scientific director of that committee for five years, and she joins us from KWBU in Waco, Texas. Dr. Steele, welcome to SCIENCE FRIDAY. LEA STEELE: Thank you for having me. DANKOSKY: Melissa Forsythe is a retired Army colonel. She's also research program manager and science officer at the Department of Defense's congressionally-directed medical research programs. She's based at Fort Detrick, Maryland. Thanks for talking to us, doctor. MELISSA A. FORSYTHE: Thank you, I'm glad to be here. DANKOSKY: And Frank deGruy is a professor and chair of the Department of Family Medicine at the University of Colorado School of Medicine in Aurora. He was also a member of the Institute of Medicine Committee on Gulf War and Health. Thank you for talking with us, Dr. deGruy. FRANK DEGRUY: Thanks for having me. DANKOSKY: We invited officials from the VA to join us for this program, but they declined. So you can give us a call. Our number is 1-800-989-8255. That's 1-800-989-TALK. We especially want to hear from Gulf War veterans on the program. If you're on Twitter, you can tweet us your questions by writing the @ sign followed by scifri. You can find out more online and follow along at sciencefriday.com. First I'm going to start with a basic question for you, Dr. Steele. I've heard the term Gulf War Syndrome for many years, then the term Gulf War Illness. There's also Chronic Multi-symptom Illness. What term, Dr. Steele, do you use and why? STEELE: Well, I use the term Gulf War Illness, and that's probably the term used most widely today. The original phrase Gulf War Syndrome was used soon after the Gulf War and was coined by the media but never really took off with either government agencies or scientists. Gulf War Illness is now used as more of an umbrella term to refer to this complex of symptoms that we see in 1991 Gulf War veterans. The other term that you mentioned, Chronic Multi-symptom Illness, that was coined in a paper produced in 1998 by Dr. Keiji Fukuda to refer to a symptom profile that they studied in Air National Guard units who had served in the 1991 Gulf War. It's used in some places, often by the VA in different ways, but overall most scientists, as well as the Department of Defense, use the term Gulf War Illness most commonly. DANKOSKY: Now Dr. deGruy, the Institute of Medicine uses the term Chronic Multi-symptom Illness. Does that term mean something different to you? Is that the term you use? DEGRUY: Well, it's a term I use, but it's only by convention and convenience. I think we're talking about the same thing. The term Chronic Multi-symptom Illness certainly includes syndromes in populations that go beyond veterans of the Gulf War. So it broadens - it both broadens and complicates the amount of information we have about people who suffer from illnesses characterized by many unexplained symptoms. DANKOSKY: Now Dr. Forsythe, is there an agreed-upon diagnosis here? How exactly is Gulf War Illness, or whatever we'll call it, how is this diagnosed? FORSYTHE: Well, that's part of the challenge that we face so that diagnosing Gulf War veterans because of the variety of symptoms that they present with, as Dr. Steele said, under this umbrella term, makes it very, very difficult. So what generally has been done is that they have been categorized as ill. Gulf War veterans are suffering from Gulf War Illness if they meet the criteria of several established case definitions. And the case definitions touch on different aspects or categories of symptoms and symptom clusters. So the CDC, for example, talks about fatigue or mood and cognition. Those are two. And then musculoskeletal symptoms and pain, whereas the Kansas criteria that Dr. Steele can talk to you about in some depth has six. So, you know, that includes fatigue, pain and neurocognitive mood but also incorporates gastrointestinal, respiratory and skin symptoms. So there are different case definitions for Gulf War Illness, and again that makes it much more challenging. DANKOSKY: OK, so Dr. Steele, why is it like this? Why is it so confusing? STEELE: Well, it's not all that confusing if you're just looking at the data that we have from many studies. These studies consistently show a similar symptom pattern in different groups of Gulf War veterans from across the U.S. and in allied countries, as well. The problem is how we scientists have chosen to define it, you know, how many symptoms from which category we will use to establish a case definition. And thus far, no government agency or official body has stepped forward to identify sort of an official case definition for Gulf War Illness. Scientists in this area would really like to see that happen, but it just hasn't happened yet. DANKOSKY: So Dr. Steele, what do we know about the causes? Because there have been a number that we've heard about over the years. Maybe we can run through a few of them. One of the things that is mentioned sometimes is stress or PTSD, something that we've heard a lot about from these last few wars, Iraq and Afghanistan. How much does stress have to do with it, do you think? STEELE: That's a really good question. I think for many years after 1991, after the war got over, a lot of folks really didn't know what to make of Gulf War Illness or Gulf War Syndrome. But at this point, now 22 years later, we actually have a lot of students that tell us a lot about what may have caused Gulf War Illness. Most of the studies early on looked at things like stress and post-traumatic stress disorder, but we now know very definitely that Gulf War Illness, specifically in 1991 Gulf War veterans, is not a stress-induced or trauma-induced kind of disorder. The rates of things like post-traumatic stress disorder are very low in 1991 Gulf War veterans, much lower than we're seeing in current returning veterans from Iraq and Afghanistan. However, there is a long list of potential causes that different people have looked at over the years, many things like the vaccines that veterans receive, the oil well fires that many of us remember from that time, all kinds of chemical toxicants that they were exposed to. And just looking over the broad range of studies, at the many epidemiologic studies that have been conducted in this population, we know that several of these risk factors or toxicants have risen to the top in terms of the strength of evidence that suggests that they are connected with Gulf War Illness. And at this point we can say that the highest risk factors relate to use of prophylactic medication given to veterans to protect them from nerve agents. That pill was called pyridostigmine bromide. 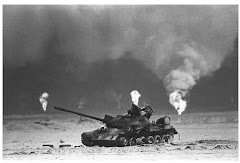 In addition, there was extreme overuse of pesticides in some groups of veterans during the 1991 Gulf War. And so those are also linked to higher rates of Gulf War Illness. And then we also know that some veterans were exposed to very low levels of nerve agents during the Gulf War, and there's also some evidence some evidence supporting an association between Gulf War Illness and the nerve agent exposures that happened during and after the war. Overall, though, the studies consistently show no link between for example serving in combat and higher rates of Gulf War Illness. DANKOSKY: So these PB pills you're talking about were meant to protect against the nerve agents, but then the nerve agents themselves are also potentially seen as a cause. STEELE: That's true. And in terms of nerve agents, it's very hard to know who was actually exposed and who wasn't. So that's harder to get definitively. But in terms of the PB pills and pesticides, we do have a better handle on who was likely exposed and at what levels. DANKOSKY: Dr. deGruy, do you have an opinion on what the causes of Gulf War Illness might be? DEGRUY: This is a multi-factorial problem that's really difficult to sort out. There are populations that have been exposed to physical agents, chemical agents, biologic agents, who have been deployed in high-stress situations, who have been exposed to those agents but not deployed. We've got a variety of cohorts that converge on a similar set of symptoms. Everything you just heard in terms of potential etiologic factors I agree with. I also think that certain highly stressful situations contribute to the manifestation of symptoms. It's an incredible multi-factorial panoply of factors that converge to produce the syndrome, and it's not clear that we're ever going to - that we're ever going to be able to find a single etiologic explanation that helps us treat in a curative or definitive fashion. DANKOSKY: Well, and I want to go to Dr. Forsythe. How important is it for us to actually know the cause of this illness in order to treat it? Because you're trying to treat these veterans. So do we need to know more about what caused it in the first place? FORSYTHE: Well, you can approach it from that perspective, that once you know what caused it, then you can treat it. You can also approach it from the perspective that once you know the symptoms, you can treat the symptoms, or you can dig deeper and try to find out what some of the underlying physiological situations are now that are transpiring with these veterans because we're so far downstream from the acute exposures, we're dealing with chronic exposure situations here with these veterans. So what actually triggered that event may not be as important as what the sequeli are and what has happened to them since then. So we also know that veterans have been trying to treat their own symptoms through a variety of means, and many - most of which are completely unscientifically - not scientifically tested, there's no scientific basis for them, but yet, you know, people are trying to use them. So we're trying to develop treatments and to validate treatments in our program that will help these veterans. DANKOSKY: When we come back from our break, we'll be talking with a Gulf War veteran, and we'd like to hear from Gulf War veterans in our audience. You can call us at 1-800-989-8255, that's 1-800-989-TALK. Our guests are Lea Steele, a research professor of biomedical studies at Baylor; Melissa Forsythe, you just heard from, a retired Army colonel; and we also have Frank deGruy, a professor and chair of the Department of Family Medicine at the University of Colorado School of Medicine as we talk about Gulf War Illness here on SCIENCE FRIDAY. We'll be right back after this short break. DANKOSKY: This is SCIENCE FRIDAY. I'm John Dankosky, in for Ira Flatow. We're talking this hour about Gulf War Illness. My guests are Lea Steele, a research professor of biomedical studies and director of the Baylor Veterans Health Research Program at Baylor University; Melissa Forsythe is a retired Army colonel and a Gulf War vet, and she's also research program manager and science officer of the Congressionally Directed Medical Research Program based at the U.S. Army Medical Research & Materiel Command at Fort Detrick. On the phone with us, as well, is Frank deGruy, he's a professor and chair of the Department of Family Medicine at the University of Colorado School of Medicine in Aurora. We're taking your calls at 1-800-989-8255, especially from Gulf War veterans. Let's go to Manuel(ph), who's in Jacksonville, Florida. Hi, Manuel. MANUEL: Good afternoon, everyone, how are you? DANKOSKY: We're doing good. What's on your mind? MANUEL: I am a public health entomologist. I was assigned to the First Marine Division, even though I was with the Navy, during the Gulf War, and that being - I am one of those walking wounded. And after six months in the Gulf, and I forget how many week, but at least three or four weeks that I never saw the sun because of the smoke and the fire that Saddam Hussein set up, being exposed to pyridostigmine and anthrax vaccine and a long list of things, I've been unfortunate to be - I am unfortunate to be one of those walking wounded. I ended up with about six months of my life where I could barely get dressed, pain all over the place. I've been tested, poked and probed and diagnosed with post-traumatic stress disorder, which I don't buy. And the VA has told me that there is no real connection between the individuals, like pyridostigmine and Gulf War; or anthrax vaccine and the Gulf war; or this and the Gulf War. However, if you take the whole concoction of things that we were exposed to and that we drank in conjunction with the air that we could cut. You can imagine, we had to wash the windshields of our vehicles with kerosene to be able to see through them because of condensation in the early mornings. And that stuff we were breathing 24 hours a day for lord knows how long. Many of us were there for months. And there is no one alive today who can tell me that the concoction that we were exposed to has no ill effects on a human life. DANKOSKY: Well, Manuel, thank you so much for your phone call. I appreciate it. Lea Steele, what do we know about this concoction, as he talks about? Are we talking about a combination of different chemicals here that is causing this? STEELE: Yes, you know, I think Manuel gave us a very good description of just the different things that were present in theater and how they may have come together, and it's really hard to tease out what caused what. 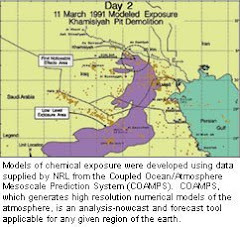 But the science and the massive amount of research that's been done in different Gulf War veteran populations, clearly shows high exposures to oil well fire smoke, pyridostigmine bromide, many of the other things he described. He's certainly not alone, and also the symptoms that he's developed since the war are certainly similar to what we hear very commonly. And in terms of the research, as I say, the research points very clearly to a range of different toxicants in theater and not specifically to stress or getting post-traumatic stress disorder. So in terms of the research, it would support his contention that his illness is connected in some way to the cocktail of exposures that he experienced while he was in theater. DANKOSKY: I'd like to bring in another guest into our conversation. Anthony Hardie is an Army veteran. He served seven years active duty, including in the first Gulf War and Somalia. He's also served on several federal advisory committees on Gulf War Illness. Thank you very much for joining me, Mr. Hardie. ANTHONY HARDIE: Thank you very much for having us all. DANKOSKY: Now you served in the Gulf War. When did you first start getting sick? HARDIE: While still in the Gulf. The team I was with was a multinational - I'm sorry, with a team co-located with the multinational forces in northeastern Saudi Arabia, near the Kuwait border. And the team that I was with, when we first began taking the pyridostigmine bromide pills, it made roughly two-thirds of my team members sick to varying degrees. Some had extreme weight loss. Lots of us had diarrhea, all kinds of other issues. We were not involved in combat at the time. I can assure the person that spoke earlier that there wasn't a stress component involved with this at all. Later on, going through - shortly after we had gone into Kuwait and gone through a set of Iraqi bunkers, we had exposures there, as well, that had characteristic odors of lewisite and mustard, two blister agents. I wound up having - developing severe lung issues that - later that night and coughed up black sputum and what I believed to have been lung tissue. For the first while, I was extraordinarily sick, was unable to perform any kind of duty for several days, extreme fatigue, malaise. The chronic cough and coughing up black sputum continued for the last two months I was in theater, and the month following when I came back. I don't believe there's any known stress condition that could cause those kinds of symptoms, chronic diarrhea, complication issues that were later diagnosed as irritable bowel syndrome, neurological issues that I continue to have in my feet and legs and hands, which talking with other Gulf War veterans are becoming increasingly common at this point, a whole host of chronic health issues. DANKOSKY: And when you say you continue to have them, you're experiencing these symptoms now, and it's continued throughout this entire 22 years? HARDIE: Continued and worsened. So I have a chronic cough that continues, the chronic symptoms I listed. Some began in the Gulf, some shortly thereafter and some that have evolved, the neurological issues that developed since then and then some memory, cognitive issues that developed while still in the Gulf and have become worse. And most significantly of all, I'm far from unique. Like the person that we just heard from, the veteran we heard from a moment ago, the Institute of Medicine, the 2010 report identified that about 250,000 of us, 697,000 Gulf War veterans, are suffering from Chronic Multi-symptom Illness, which we call Gulf War Illness. And to put that in perspective, that's more than one in three of us, and I'll say that again, more than one in three who served in the 1991 Gulf War are still today suffering from Gulf War Illness issues. DANKOSKY: We talked about the nerve agents, these pesticides, the PB pills that you say that you know that you were exposed to, Anthony Hardie. Melissa Forsythe, how conclusive do you think the evidence is on these three things being the cause? FORSYTHE: Well, we've certainly seen a lot of evidence that has shown a correlation between the exposure to - high exposure to pesticides and to subsequent actual abnormalities in brain structure and function and the other exposures, as well. So there is some very strong evidence out there. And we're also starting to see now, again, I talked earlier about, you know, the sequeli that are developing, and that's what Anthony was just referring to. But the current physiologic status of these veterans, and we're starting to see some real physiologic markers, if you will, of Gulf War Illness that differentiate them from their non-ill colleagues or cohorts, companions in the Gulf, who were deployed but who are not ill. So one was just highlighted in the USA Today, yesterday, and that's a study that we funded out of our office, Dr. Ronald - Dr. James Baraniuk who's at Georgetown University. And he found some very significant associations between blood flow and links in the brain that control fatigue, pain, emotion and reward and also cognition, those different parts of the frontal brain that affect those higher types of functions. And those were different on functional MRI from a matched set of subjects who do not have Gulf War Illness. So, I mean, we're starting to see some really very conclusive evidence in terms of what the status is of these veterans now. DANKOSKY: So Anthony Hardie, does this - does it matter to you at this point if the cause of Gulf War Illness is actually found? HARDIE: That's a wonderful question. It's debated widely in the Gulf War veteran communities. And for me personally, I'm less concerned about what the specific cause is. I think there were countless toxins that alone we've seen studies that have demonstrated in animals and in others that some of these could cause Gulf War illness symptoms alone. But I think what, to me, is most important of all - and I should say this is coming from the perspective of someone who has served on this panel of the Congressionally Directed Medical Research program, has seen virtually every research proposal that's been proposed regarding treatments in - since 2006, in the history of this program. To me, what's most - what's really clear that many researchers are making great strides towards unraveling and treating Gulf War illness without the need to know the specific substance of causation. And in unraveling the specifics of what's happening now in our brains and bodies of us Gulf War veterans appears to be at least as relevant, if not more relevant to the identification and treatment - and development of effective treatments. And I think us Gulf War vets, most importantly, to - it's almost everyone I hear from, is we simply want to see an improvement in our health. DANKOSKY: Anthony Hardie's an Army veteran who has served seven years on active duty, including in the first Gulf War and Somalia. Thank you so much for joining us. I appreciate it. DANKOSKY: Let's go to Charmaine(ph), who's calling from Jaille(ph), Alaska. Hi, there, Charmaine. CHARMAINE: Hi. How are you doing? DANKOSKY: Good. What's on your mind? DANKOSKY: Lea Steele, what - and this is something. Thank you, Charmaine, for the question. A lot of people wonder about chronic fatigue syndrome. STEELE: Yes. There's a number of conditions that we see in civilians that have some similarities to Gulf War illness. So an example would be chronic fatigue syndrome, fibromyalgia, conditions such as those. There are actually a number of studies, and they have identified high rates of diagnosable fibromyalgia or chronic fatigue syndrome in Gulf War veterans. But certainly, these syndromes do not account for all the multi-symptom illness that we see in Gulf War veterans. And in the biological studies that compare veterans with Gulf War illness to people with chronic fatigue syndrome and fibromyalgia, we see some similarities and some differences. So I think most of us believe at this point that there may be some similarities in the pathophysiological mechanisms associated with these conditions, but they are not identical. DANKOSKY: Do we know anything about similar symptoms that are found in Iraqi people who were there during this time in the Gulf? We got a tweet, somebody asking that question. Dr. Steele? STEELE: Is that for me? DANKOSKY: Yeah. I'll ask you. STEELE: Yes. Yes. Actually, the veterans who have returned from Iraq and Afghanistan certainly have some serious problems, and many of them are associated with symptoms. But the symptoms have some overlap with what we see in Gulf War illness, so some of the neurological problems, et cetera, that we see in Iraq and Afghanistan veterans are associated with traumatic brain injury, can be associated with post-traumatic stress disorder. DANKOSKY: Yeah, and I apologize, but this is in the latest Institute of Medicine reporting. It includes a line about many symptoms reported in Iraq and Afghanistan war veterans, including headaches, chronic pain, disrupted sleep, fatigue and attention memory problems overlap with these symptoms experienced by 1991 Gulf War veterans. I was actually asking a different question. I'll put that quickly to Dr. deGruy, though. What does that mean, that there is this overlap between people in this Iraq and Afghanistan theater and the Gulf War back in 1991? DEGRUY: And also overlap with a number of multi-symptom illnesses in civilian populations. It's hard to sort out. There may be specific ideologic components that drive a set of symptoms. There may be convergence of multi-factors that lead to same symptom presentations, and we cannot clearly sort out what is likely to be effective in terms of treatment, what is likely to be similar or identical ideologic agents at this point. There's just - these are circles in a Venn diagram with large degrees of overlap. DANKOSKY: I'm John Dankosky, and this is SCIENCE FRIDAY, from NPR. Dr. Forsythe, we mentioned some treatments, so let's talk about what could be out there, because I know some Gulf War vets are wondering what treatments they could seek. What are some things that you see as promising right now? FORSYTHE: Well, we have a number of studies that are ongoing. And one of the things I just wanted to mention briefly is that we're poised to make two large awards to start - two consortia that will be bringing experts in the field of Gulf War illness together, to study different overarching questions related to Gulf War illness and to be able to pool their resources synergistically and study larger numbers of veterans than we have been able to do to date. So we're excited about those. Those are, as I said, those are in the wings. Those are coming. And part of their goals will be to look at, develop and identify new treatments. But we have a couple of things in small studies from - that were previously funded. We have one that was looking at the use of Coenzyme Q10 that had some limited applicability, it seemed, to help veterans with their sensations of fatigue after exertion, which is important. Because if you don't get so tired when you do minimal activities and you can do more, that might help other areas of your own health. We've also had a study that just concluded, looking at the value of acupuncture in treating the symptoms, again, of Gulf War illness - not getting at the causative factors, but treating the symptoms of Gulf War illness. And that also seems to have promise for those veterans who were included in that study. Those both need to be replicated in larger samples in order to be able to yield real results. We just also had a study that concluded Dr. Ronald Bach, who's at the Minneapolis VA, and he was looking for immune ties to Gulf War illness and as markers of systemic inflammation. And what he had found was - and this may lead to treatments. This is why I'm telling you this. A substance called C-reactive protein, which is a marker of systemic inflammation in the body, and that those levels were significantly higher in ill Gulf War veterans and - versus their asymptomatic counterparts. And he has identified what he calls the Gulf War proteome, which is a collection of 18 plasma proteins that include cytokines, metabolic factors, some growth factors and other factors involved in tissue modeling, that, taken together, they demonstrate a signature, if you will, that identifies the ill - identify the ill Gulf War veterans in that sample from their, again, their non-ill counterparts. DANKOSKY: Well, and we're running a bit low on time, I want to ask Dr. Steele, as we wrap up: What you hope happens next? You've been studying this for quite some time, and we've been wondering whether or not we're going to get to some sort of a cause. Do you think that we're going to get to the bottom of what has caused this terrible condition for 250,000 or more veterans? STEELE: Well, I think the question of cause is two-pronged. I do think that we're getting at what initially caused the problem, but more importantly, we want to know what biological processes are causing veteran symptoms. And so we are getting much closer to understanding that, as well, as Dr. Forsythe mentioned. We see differences in the brain, in the autonomic system, in the immune system, in the endocrine system. So we are getting very close to understanding biological processes that are causing veterans' symptoms. But then my ultimate hope, of course, is that we can use that information to identify effective treatments for veterans who are still sick 22 years after the war. DANKOSKY: Dr. Lea Steele is a research professor of biomedical studies and director of the Baylor Veterans Health Research Program at Baylor University. Thank you so much for joining us. DANKOSKY: Thanks also to Melissa Forsythe, a retired Army colonel, also a research program manager and science officer for the Congressionally Directed Medical Research Program at Fort Detrick. Thank you very much. Thanks also to Frank deGruy, professor and chair of the department of family medicine at the University of Colorado School of Medicine in Aurora. We're going to come right back after this short break.